Home People Eric Steinberg, D.O. Academic Interests - Innovative ways of delivering educational content during weekly conference, as well as finding more meaningful and unbiased means to assess residents’ performance and progress. My Other Interests:I like to eat, especially foods involving bacon. Searching for bourbons I haven’t tried yet. Avid Yankees and Giants fan. 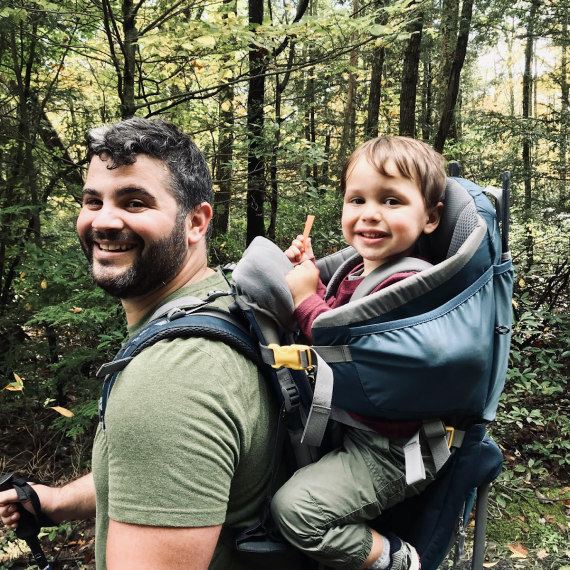 Love to hike NY trails and national parks with my boy on my back My Backstory in Brief: I was born in Pearl River, NY (NOT Westchester, Long Island, or “Upstate”!). I went to college at SUNY Binghamton (the Harvard of the SUNY system), and medical school at New York College of Osteopathic Medicine (the Harvard of the DO schools). I’ll be completing my Masters in Education for Health Professions (MEHP) from Johns Hopkins University in Spring 2019.